Part 1: Festive Time for a Sunny Harvest! Seventy percent of India's population lives in villages, and a vast majority of people solely depend on agriculture. As a result, we find that most Hindu festivals are directly or indirectly linked to agriculture and related activities. Pongal is one such big festival, celebrated every year in mid-January--mostly in the south of India and especially in Tamil Nadu--to mark the harvest of crops and offer a special thanksgiving to God, the sun, the earth, and the cattle. 'Pongal' comes from the word 'ponga,' which literally means 'boil,' and so the word 'pongal' connotes 'spillover,' or that which is 'overflowing'. It's also the name of the special sweet dish cooked on the Pongal day. Pongal continues through the first four days of the 'Thai' month that starts on January 14 every year. Pongal is directly associated with the annual cycle of seasons. It not only marks the reaping of the harvest, but also the withdrawal of the southeast monsoons in southern India. As the cycle of season rings out the old and ushers in the new, so is the advent of Pongal connected with cleaning up the old, burning down rubbish and welcoming in new crops. Pongal in the state of Tamil Nadu is celebrated during the same time as 'Bhogali Bihu' in the North Eastern State of Assam, Lohri in Punjab, 'Bhogi' in Andhra Pradesh and 'Makar Sankranti' in the rest of the country, including Karnataka, Maharashtra, Uttar Pradesh, Bihar, and Bengal. Assam's 'Bihu' involves the early morning worship of Agni, the god of fire, followed by a night-long feast with family and friends. Bengal's 'Makar Sankranti' entails the preparation of traditional rice-sweets called 'Pittha' and the holy fair--Ganga Sagar Mela--at the Ganga Sagar beach. In Punjab, it's 'Lohri' - gathering around the sacred bonfire, feasting with family and friends and exchanging greetings and pleasantries. And in Andhra Pradesh, it is celebrated as 'Bhogi', when each household puts on display its collection of dolls. Each day of the four-day festival has its own name and distinct fashion of celebration. Bhogi Pongal is a day for the family, for domestic activities and of being together with the members of the household. This day is celebrated in honor of Lord Indra, "the Ruler of Clouds and Giver of Rains". On the first day of Pongal, a huge bonfire is lit at dawn in front of the house and all old and useless items are set ablaze, symbolic of beginning a fresh new year. The bonfire burns through the night as young people beat little drums and dance around it. Homes are cleaned and decorated with "Kolam" or Rangoli --floor designs drawn in the white paste of newly harvested rice with outlines of red mud. Often, pumpkin flowers are set into cow-dung balls and placed among the patterns. A fresh harvest of rice, turmeric, and sugarcane is brought in from the field as preparation for the following day. The second day is dedicated to Lord Surya, the Sun God, who is offered boiled milk and jaggery. A plank is placed on the ground, a large image of the Sun God is sketched on it, and Kolam designs are drawn around it. This icon of the Sun God is worshiped for divine benediction as the new month of 'Thai' begins. This third day is meant for the cattle ('mattu')--the giver of milk and puller of the plow. The farmer's 'dumb friends' are given a good bath, their horns are polished, painted and covered with metal caps, and garlands are put around their necks. 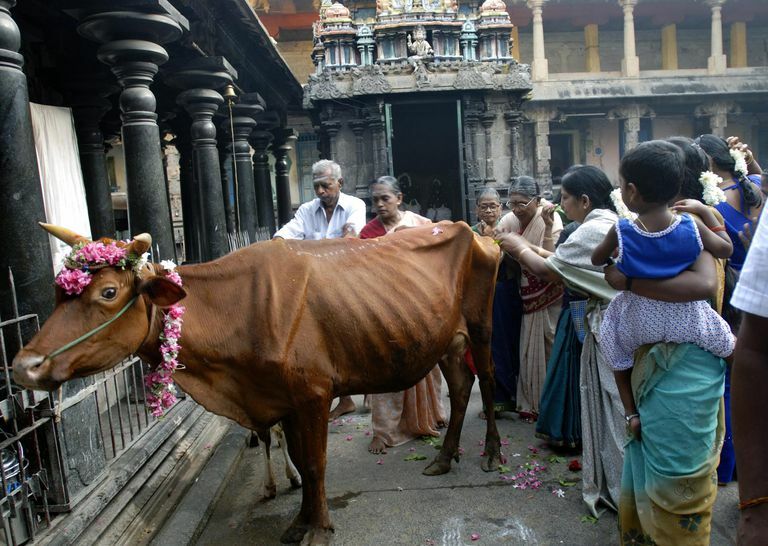 The pongal that has been offered to the gods is then given to the cattle to eat. They are then taken out to the racing tracks for cattle race and bullfight--Jallikattu--an event full of festivity, fun, frolic, and revelry. The fourth and final day marks the Kanya Pongal when birds are worshiped. Girls prepare colored balls of cooked rice and keep them in the open for birds and fowls to eat. On this day sisters also pray for their brothers' happiness. fields, since they would now need to grow more grains, due to his mistake.Like all Hindu festivals, Pongal also has some interesting legends attached to it. But surprisingly, this festival has little or no mention in the Puranas, which are usually bristled with tales and legends related to festivals. This is perhaps because Pongal is preeminently a Dravidian harvest festival and has somehow managed to keep itself away from the preponderance of Indo-Aryan influences. On this day Indra, being honored by all, became proud and arrogant. To teach him a lesson, Lord Krishna asked his cowherd friends to worship Mount Govardhan instead of Indra on the Bhogi Pongal day. Infuriated, Indra sent forth the clouds to generate thunder, lightning and heavy rains, flooding the land. But Lord Krishna lifted up the Govardhan Mountain on his little finger and sheltered the farmers, cowherd and their cattle. Indra then begged Shri Krishna's forgiveness and the latter re-permitted Bhogi celebrations in honor of Indra. According to another legend associated with Mattu Pongal, on the third day of celebrations, Lord Shiva once asked his Nandi bull to go to earth and deliver a special message to his disciples: "Have an oil bath every day, and food once a month." But the baffled bovine failed to deliver the correct message. Instead, he told the people that Shiva asked them to "have an oil bath once a month, and food every day." 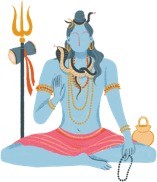 The enraged Shiva then ordered Nandi to stay back on earth and help the people plow the fields since they would now need to grow more grains, due to his mistake.